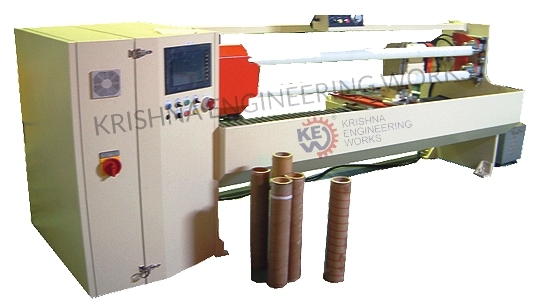 Krishna Engineering Works dealing on manufacturing and exporting Core Cutter Machine from India. A genuine specialized supplier of Core Cutter Machine. We are manufactures, exports & supplies Core Cutting Machine for cutting of paper core. Our machines are designed with a wide range of quality for long lasting heavy duty process, specially for cutting in different sizes from 12 mm to 1000 mm. Different types of Core Cutter Machine. Paper Core cutting used for Bopp tape, also manufacturer of BOPP tape Slitter Rewinder Machine with International Standards. Fully Automatic Core Cutting, Automatic paper Core cutter, Manual Core Cutting Machine with International Standard of quality. High-quality Paper Core Cutting ready in stock, also, jumbo type for long lasting production business. Core Cutter Manufacturer for custom desired size and length of machine and paper core. Convertors are in constant need of different type of cores according to the size of prints or slitted material. KEW Make Core Cutting Machine Serves this purpose. Maximum width of cut : 450MM. Paper core inside diameter : 76mm. Paper core thickness : 12 mm. Round Blade Diameter : 150 mm. Electric Motor : ½ H.P.A.C.